Corticosteroid injections involve the introduction of medication into an area of pain. The medication is related to cortisol/cortisone, a steroid found in the human body (produced by the adrenal cortex). A corticosteroid injection is used to reduce inflammation in the area of pain. Often corticosteroids are mixed with a local anaesthetic to “freeze” the area of pain. The local anaesthetic provides immediate relief. 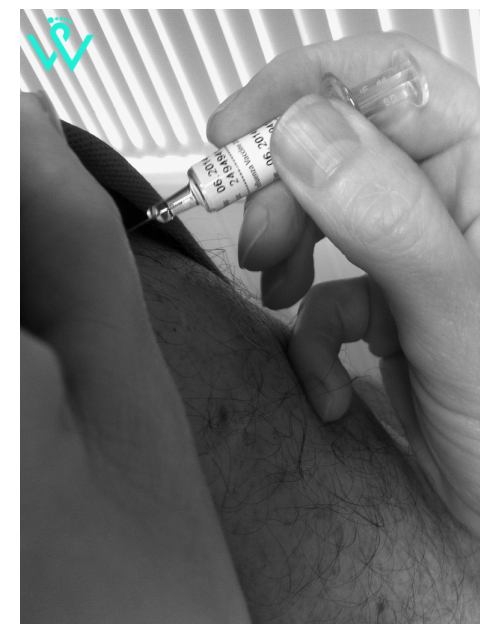 This helps with the initial burning pain of the corticosteroid, but also lets the practitioner know the correct area has been injected. Corticosteroids do not have to be injected, they may be given orally or your Chiropodist may provide you with a topical prescription (eg: hydrocortisone cream). Corticosteroids are not pain relievers; the pain is relieved because the inflammation is gone. Corticosteroids can eradicate the pain completely, however there is a possibility that the corticosteroid may just become a band aid solution. This occurs when the cause of the inflammation has not been addressed. Eg: faulty biomechanics leading to plantar fasciitis. A corticosteroid will remove the pain for a “x” amount of time, since the faulty biomechanics have not be addressed the plantar fasciitis will most likely re-occur. At Waterloo Foot Clinic we will provide a holistic approach, doing our best to prevent recurrence.